Fifty-six percent of Latinos in the U.S. use the internet. Latinos comprise 14% of the U.S. adult population and about half of this growing group (56%) goes online. By comparison, 71% of non-Hispanic whites and 60% of non-Hispanic blacks use the internet. Several socio-economic characteristics that are often intertwined, such as low levels of education and limited English ability, largely explain the gap in internet use between Hispanics and non-Hispanics. Just one in three Latinos who speak only Spanish go online. 76% of U.S.-born Latinos go online, compared with 43% of those born outside the U.S. Some of this is related to language, but analysis shows that being born outside of the 50 states is an independent factor that is associated with a decreased likelihood of going online. Mexicans are the largest national origin group in the U.S. Latino population and are among the least likely groups to go online: 52% of Latinos of Mexican descent use the internet. Even when age, income, language, generation, or nativity is held constant, being Mexican is associated with a decreased likelihood of going online. 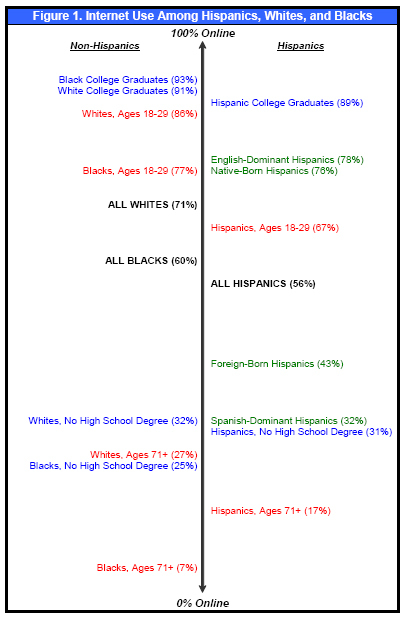 Differences in levels of education and English proficiency explain much of the difference in internet usage between Hispanics and non-Hispanics. Internet use is uniformly low for whites (32%), Hispanics (31%), and African Americans (25%) who have not completed high school. However, 41% of Latino adults have not finished high school, compared with about one in ten non-Hispanic whites and one in five African Americans. The same pattern is evident at the other end of the spectrum of educational attainment. College-educated adults all have equally high levels (about 90%) of internet use regardless of race or ethnicity, yet the college educated make up a smaller share of the Latino population when compared with non-Hispanics. Language is also a powerful factor, as internet use is much higher among Latinos who speak and read English fluently than among those who have limited English abilities or who only speak Spanish. Language is not an issue in the white and black populations as the shares of adults with limited English abilities is quite small. A statistical analysis of the survey results shows education and language are each highly significant factors when other differences in group characteristics are taken into account. When the different levels of language or education are controlled statistically, Hispanics and non-Hispanics show similar levels of internet use. Latinos are less likely than whites to have an internet connection at home. Just 29% of Latino adults have a broadband connection at home, compared with 43% of white adults. This is mostly due to the fact that Latino internet users are less likely than non-Hispanic white internet users to have any type of internet connection at home (79%, compared to 92%). Among the 79% of Latinos who do have a home internet connection, 66% have a broadband connection, which is actually similar to the rate among non-Hispanic white internet users with a home connection (68%). Some Latinos who do not use the internet are connecting to the communications revolution in a different way – via cell phone. The communications revolution is not limited to the computer screen. Fully 59% of Latino adults have a cell phone and 49% of Latino cell phone users send and receive text messages on their phone. Looking at the numbers in a different way, 56% of Latino adults go online, 18% of Latino adults have a cell phone but do not go online, and 26% of Latino adults have neither a cell phone nor an internet connection.